For applications requiring automation, Vobis offers system integration solutions employing robotic control methods to complete an application-specific process workflow, ie Intelligent Plant Design. 1). Primarily implemented where the molded products manufacturing needs to be fully integrated and automated for automatic material handling. 2) For the product which needs to place embedded parts, the is system is equipped with a double arm robot in the molding machine, and also equipped with corresponding fixture. 3) System can be equipped with two sets of fixtures, and use robot arm to automatically change the fixtures. 4) System can be equipped with an assembly line, with an Independent control system for each part of the assembly line, complete with signal transmission between each subsystem. The system overall will have a system start and stop as well as integration of each of the subsystems into the control logic to deal with all kinds of unexpected situations, Emergency stop and pause switch are arranged for the whole line. 1) Small and Fully enclosed workshops can be integrated into the full workshop to insure dustless and insect free environment as well as a dessicant technology to reduce the wear and tear on the automated system. 2) Through the Monitoring System, display, and large screen outside of the workshop, to provide Real-time monitoring of each process link and the production process status of whole workshop. 3) There is an Independent control system in the each part of the assembly line/production line, and it has a signal transmission between each of the subssystems. 1) Concentrate filling bunker system: can monitor the operational status of the pre-expander, providing production data collection and monitoring of the bunker automatic configuration system and automatic accessories system of the molding machine. 2) The molding machine is equipped with slung-load drying line, which can have incorporated the monitoring of molding machine’s running status, temperature and humidity of the drying room, and production data collection. 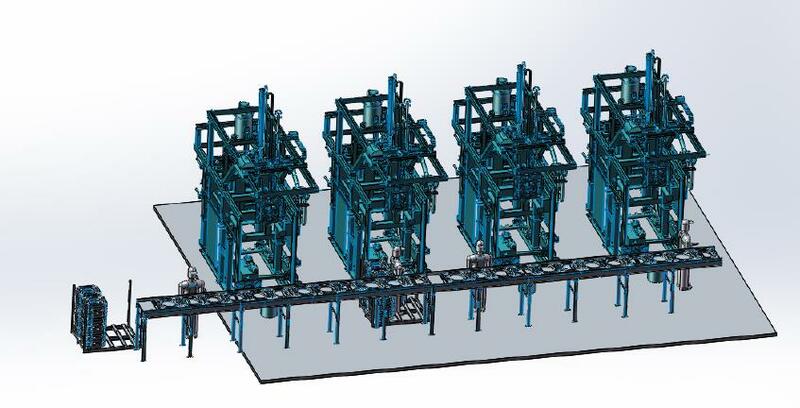 3) Provide monitoring and control for the molding machine, energy utilities system, prefoaming system, and package workroom according to the plant layout.